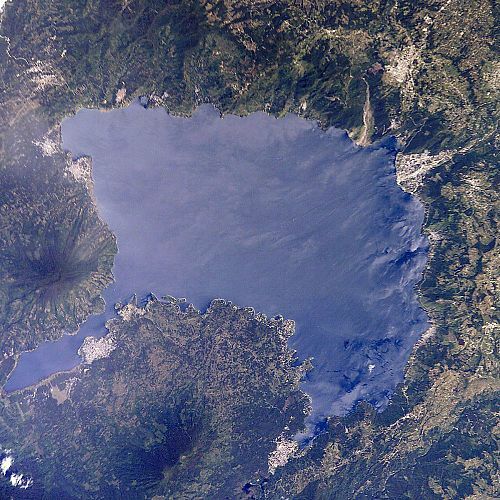 With a length of 50 miles, Lake Chapala is the largest fresh water lake in Mexico (about 50 miles long). There are 2 towns on thisstunning lake that have attracted adventurous Americans to second homes or to live in retirement. The lake is about 28 miles from nearby Guadalajara – many of whose citizens come here for a weekend retreat. 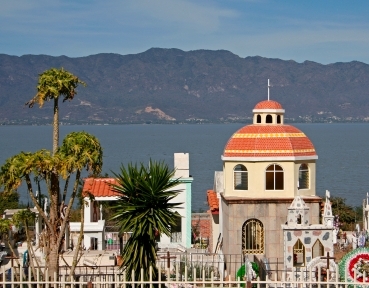 The town of Chapala (also called Lakeside) on the lake’s north shore is more authentic Mexican; generally Mexicans and U.S. expatriates live here side by side. According to the 1990 census, its population is 15,664. Ajijic (pronounce it as ah-hee-heek), about 5 miles away from Chapala, has many gated communities made up of mostly of folks from the U.S. and Canada. About 15,000 people live in Ajijic. Most of the Americans tend to live here only in winter. Both towns have charming plazas and churches. The narrow cobblestone streets go past homes hidden by stone or brick walls. There are many hotels, B & Bs, and restaurants catering to the expatriate community. Other than the beauty and recreation provided by the lake, another reason for Americans to live in the Lake Chapala region is its low cost of living. There are many small towns around Lake Chapala to choose from. Chapala is the municipality and towns such as Ajijic, San Antonio Tlayacapan, Chula Vista, Riberas del Pilar and Mirasol are towns within the municipality. Jocotepec is another municipality just west of Ajijic and many expats choose Jocotepec and San Juan Cosala (town within the municipality of Jocotepc) due to the cost of Living be much less. The lake is also a critical habitat for several species of migratory birds, such as the White Pelican. Cobblestone streets. Beautiful homes and spacious grounds. Your choice of living in a gated community or side by side with Mexicans. Considerable charm and great beauty. Safety in numbers. Great climate and low cost. Unfortunately Lake Chapala is polluted and the source not cleaned up yet. Uncertainty and danger of living in the 3rd world far from home. Not well connected with the rest of the U.S. The year round average temperature near Chapala Lake is about 72 degrees. It ranges from a low of about 50 degrees in winter months to about 90 degrees in summer. The rainy season runs from June through October. Chapala is about 28 miles southeast of Guadalajara, Jalisco and stands at 1,524 meters (close to 5000’) above sea level. It is a shallow lake. There is amateur theater, October concerts and ballet, and an opera season. Among the area's cultural attractions is mariachi music, for which the state of Jalisco is particularly known. Guadalajara has a major airport. Driving to Chapala from the U.S. is not for the feint of heart.